The Indicator Panel is used to add, edit and delete indicators in the open project. It is also used to change the settings for Point & Figure charts. When you save >> an indicator it is saved in whichever project file is open on the project tabs. You do not need to save using File commands. Select Indicators on the main menu to open the Indicator Panel. Select an indicator in the left column. Adjust the indicator's settings in the center panel. Click to save the indicator. Click to close the Indicator Panel. Separate charts are created for daily, weekly and monthly views. With Incredible Charts you can, for example, add Daily indicators to a Monthly chart or Weekly indicators to a Daily chart. Hint When adding indicators that appear on the price chart, be sure that you have the required Daily, Weekly or Monthly chart in view. The indicator will be added to whichever chart is open. Select the indicator from the right-hand column. Amend the settings in the center panel using the up- or down- arrows or type over the existing numbers. Click to save the new settings. Hint If you are going to amend indicator settings in a file, save a backup version (under a different name) using Save File As command. Also, Backup your settings on a regular basis. Click to remove the indicator. Hint When deleting indicators that appear on the price chart, be sure that you have the required Daily, Weekly or Monthly chart in view. The indicator will be deleted from whichever chart is open. Hint You cannot remove all indicators from the right column of the Indicator Panel. The default settings, shown in the right column below, cannot be deleted. This is an advanced feature that enables you to smooth your indicator results or add a signal line with a moving average. Details can be found at Indicator Smoothing. The Relative Strength Indicator is set up using the Price Comparison Indicator. When you save an indicator it is saved in whichever project file is open on the project tabs. You do not need to save using File commands. 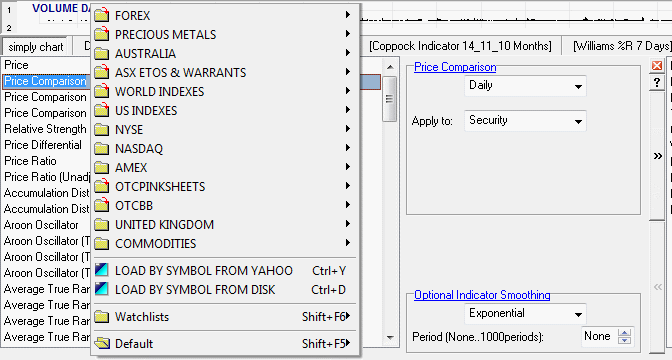 Open the Indicator Panel and select Price Comparison at the top of the left column. For example, select the S&P 500 [SPX] under Indexes or All Ordinaries [XAO] under Australia. Select Apply to Project if you want Realtive Strength to display all stocks; Apply to Security if you only want to display RS for the current stock. Click to save an indicator.